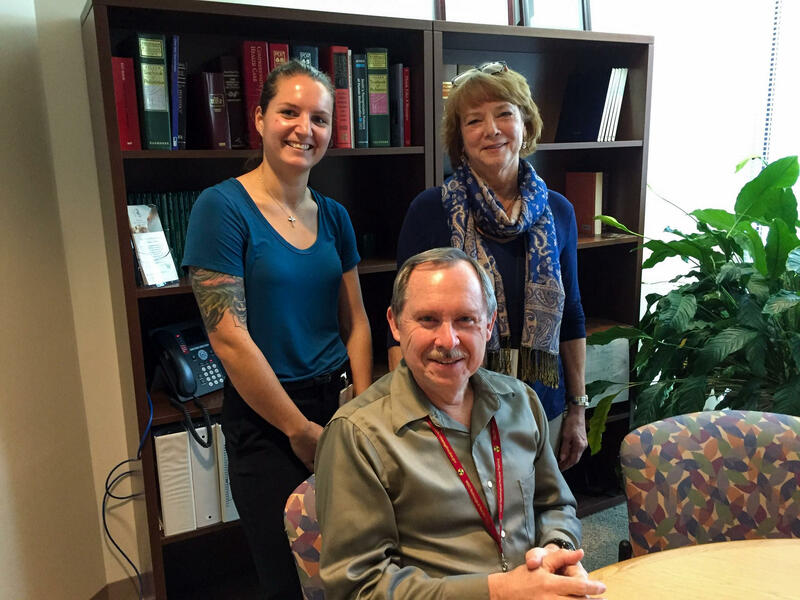 Dr. John Lanza, director of the Florida Department of Health in Escambia County and staffers Kimberly Pace and Versilla Turner discuss the 2019 Community Health Needs Assessment. Sandra Averhart reports on the chosen health priorities of diabetes, infant health and mental health for Escambia and Santa Rosa counties. 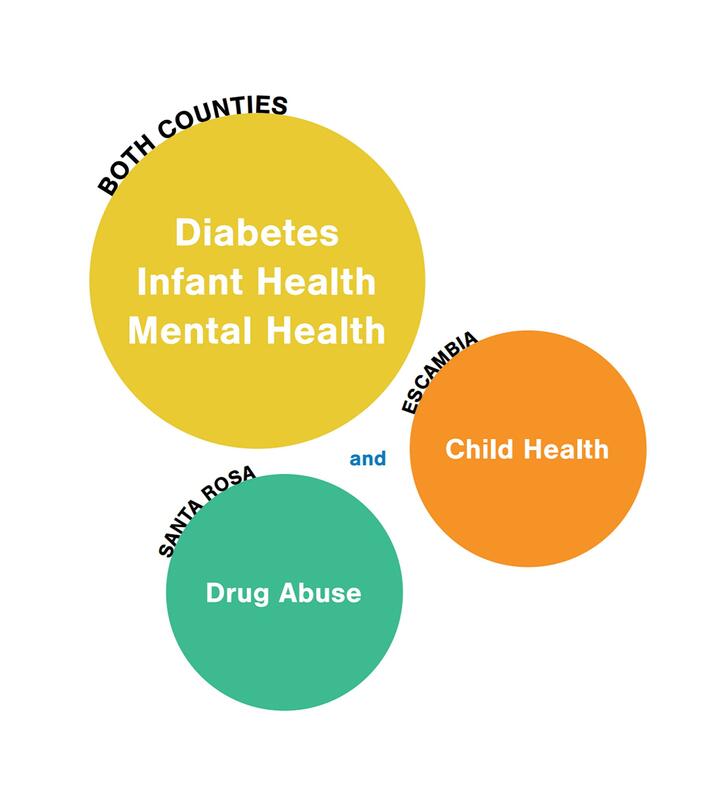 The Florida Departments of Health in Escambia and Santa Rosa counties and their partner organizations recently released their 2019 Community Health Needs Assessment. The document identifies the top health priorities for both counties for the next couple of years. This latest Community Health Needs Assessment was a year in the making, completed last year with input from health care and social service leaders, and hundreds of local residents. Health educator and consultant Kimberly Pace took part in the process on behalf of the state Department of Health in Escambia. “We wanted to focus on what was making people sick, what was causing early death and how are those issues in the community,” explained Pace. 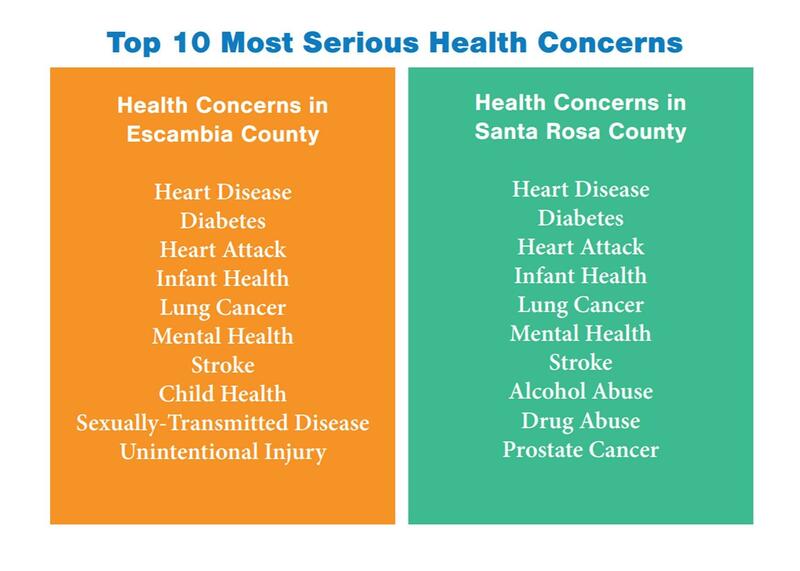 This graphic reflects the health priorities chosen for Escambia and Santa Rosa counties in the 2019 Community Health Needs Assessment. Using data from various sources including Florida Health Charts, the annual County Health Rankings & Roadmaps report from the Robert Wood Johnson Foundation, and local survey responses, the top health priorities were narrowed from a list of the Ten Most Serious Health Concerns, which in both counties included heart disease and heart attack, lung cancer, and stroke. “They decided that they wanted to focus on diabetes, infant health, (and) mental health as the top three from both counties,” Pace continued. Not surprisingly, the region’s health priorities disproportionately affect those who are black and poor. When it comes to diabetes, 2016 statistics show 16.4 percent of adults in Escambia and 13.7 percent in Santa Rosa were told they have the disease. That compared to nearly 12 percent in Florida. Additionally, from 2015 to 2017 diabetes claimed the lives of just over 400 people from the two-county area. Turner says the good news is that both counties have a bit of a head start when it comes to addressing diabetes, since they’ve been at it for a while. In addition to what’s being offered by area hospitals and other organizations, county health departments are running some diabetes prevention programs. But, as Turner explains, the focus on mental health as a health priority is new territory for the county health departments. This means utilizing the expertise of agencies such as Lakeview Center to help guide the community’s approach to dealing with mental health; mental disorders led to a combined 5,900 ER visits and over 6,600 hospitalizations in 2017. To back up their choice of infant health as a priority, statistics show 1,700 low weight births and 119 infant deaths across the two counties over the three-year period between 2015 and 2017. Dr. John Lanza is director of the Florida Department of Health in Escambia and a practicing pediatrician. He says one key factor is interconception health, or the health of a woman between pregnancies. Dr. Lanza is eager to see this particular issue addressed, because their efforts to this point have not been very successful. Beyond the joint focus on improving the health of babies, Escambia County also will concentrate on the next phase of early childhood health. Further, Escambia has identified sexually transmitted diseases as a health priority, pointing to a rise in the number of Syphilis cases in the past decade from about 10-15 cases per year to a range of 80-100 annually. Specific to Santa Rosa County, prostate cancer made their list of Most Serious Health Concerns. But, Matt Dobson, public health services manager at the Florida Department of Health in Santa Rosa, says their research led them to focus on substance abuse. “We saw that there were significant amounts of incidences based upon the data we collected from emergency rooms, law enforcement agencies, Florida Charts, and other things we would get our data from talked about alcohol abuse and drug abuse for Santa Rosa County,” stated Dobson. The Community Health Needs Assessment is phase one of a three year process. Next, is a collaborative effort among health leaders and residents in the two counties to produce a Community Health Improvement Plan - or CHIP – beginning in a few weeks. As part of the process, a series of public forums soon will be announced. To view the entire Community Health Needs Assessment for Escambia and Santa Rosa counties, links are available on the local health department’s websites.